Weave Path is an even more effective Warrior's Boot, playing a creature from discard instead of hand for a cost of 1 for a Weave magi. The downside is that the creature played this way cannot use its power, but since Weave is an effect dependant region, this shouldn't affect most of the creatures. Like all Weave cards, this card is very particular about the creature it targets - i.e. Weave. 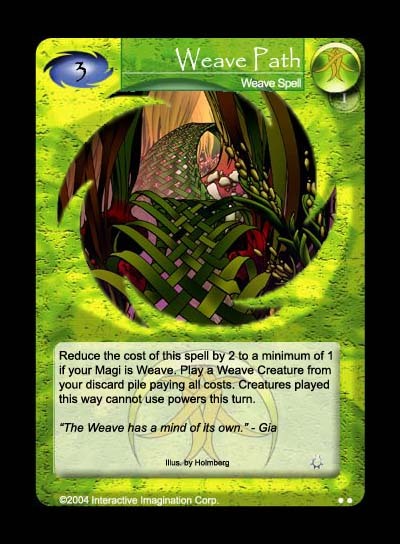 The artwork, like the other 4 Weave cards in the set is from the promotional Weave piece from 2i.